Were You Fired or Harassed for Reporting Fraud? All whistleblower laws include employee anti-retaliation provisions to stop companies from firing, demoting, or harassing employees who report fraud or illegal conduct to their employers or elsewhere. 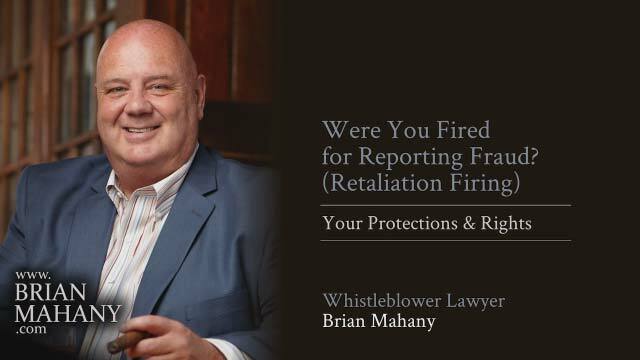 Brian Mahany, whistleblower author and lawyer with a national practice explains your rights as a whistleblower. Were you fired or demoted for blowing the whistle? This short video will help you understand your legal rights as a whistleblower. Many people don’t report fraud or corruption because they are afraid of losing their job. Most state and federal laws that protect workers and tax payers also have anti-retaliation provisions. Common examples include: Anti-discrimination laws, overtime laws, work place safety laws and the Federal False Claims Act. At Mahany law, we represent whistleblowers who report fraud involving government funds and programs, unpaid taxes, and foreign bribery. If you think that you were fired, demoted or made to suffer because you reported illegal conduct, we may be able to help you get back your job or get a monetary award for the losses you suffered. As a whistleblower, we may be able to get you a sizeable award for your information too. Retaliation can take many forms and be motivated by many different reasons. If your case isn’t something we handle, we often can direct you to someone who will be able to help. The Federal False Claims Act, is the largest whistleblower program in the nation. In 2014, the government paid out over $435,000,000 in award monies to people who reported fraud. Even if you don’t receive an award, you may still be protected by these anti-retaliation provisions. Those rules allow for double damages for lost wages and legal fees too. The Securities and Exchange Commission operates a smaller whistleblower program that also pays award and also has powerful anti-retaliation provisions. Before becoming a whistleblower, we urge you to contact us first. If you are listening to this and believe that you have already suffered retaliation, give us a call too. Whistleblowers are heroes and should be respected by their employers. We know that that isn’t always the case and we will work aggressively with you to protect your rights and insure you receive the maximum whistleblower award possible.